This week I’m doing a smidge better than last – I have two whole pictures for you 🙂 … Things will slow down eventually, right? Breakfast: I’m still on the smoothie kick that I was on last week. Was it just last week? Yeah. I think so. This is a peanut butter and jelly smoothie. Uh. Before I remembered to add the peanut butter. Soy milk, kale/spinach, strawberries, cherries, blueberries, flax meal, chia seeds and peanut butter. 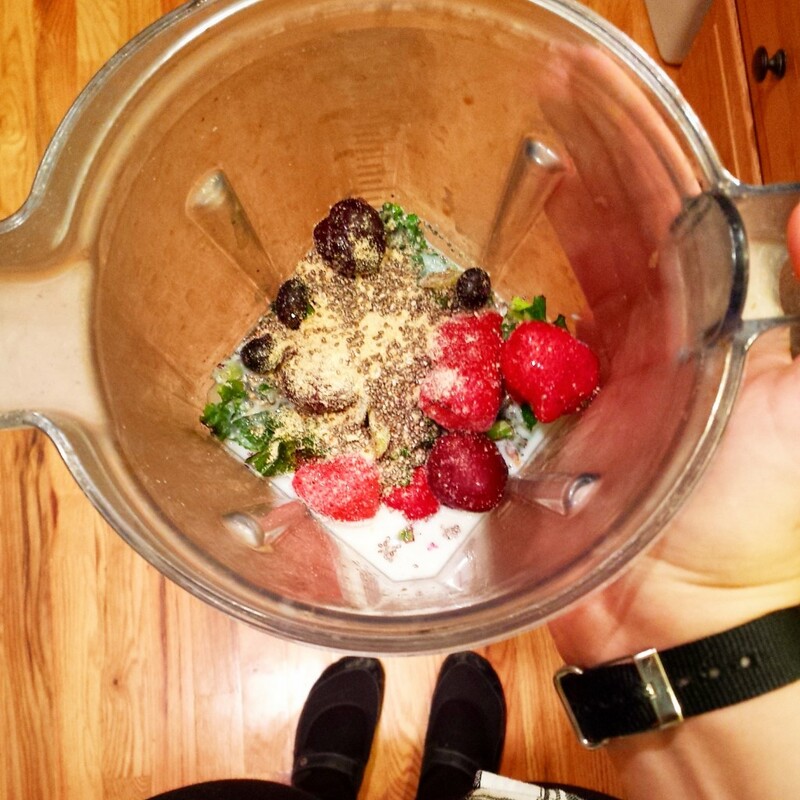 I really enjoy the flax meal added to this smoothie – it really helps with the “pb&j” effect. Lunch: Was a quick salad that had terribly spiky lettuce. For real. Who likes eating spiky lettuce? Dinner: Well, that picture is post dinner. I had some veggie chili. 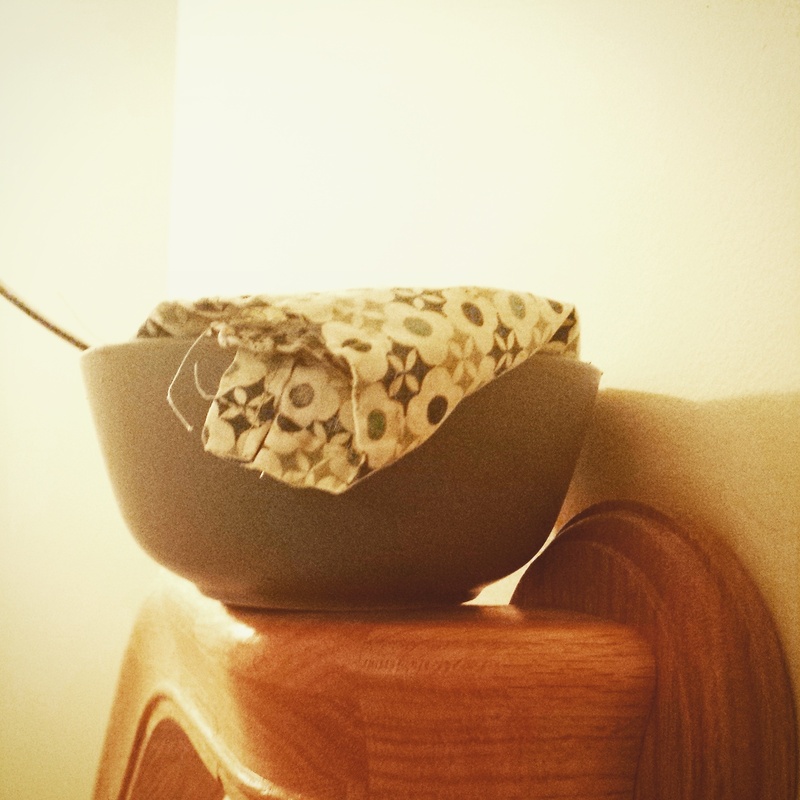 And…yes…my bowl is perched on top of the banister of my stairs. Because I needed to remember to take it downstairs to the kitchen, and didn’t want a curious kitty licking it. So those were a very hectic Monday eats. 🙂 I’ll see you tomorrow for Thinking Out Loud Thursday! I’ve been struggling with my wiaw photos, too. I do hope life slows down a bit for you! I saw in a vlog you did that you’re switching jobs so best of luck with that, as well!!!!! And I am obsessed with smoothies, too 🙂 Even my son is hooked and says ‘smoothie’ everytime he sees spinach haha. Ahh I’m glad I’m not the only one!!!!!! 🙂 🙂 🙂 I plan to have smoothie-obsessed kids in the future!